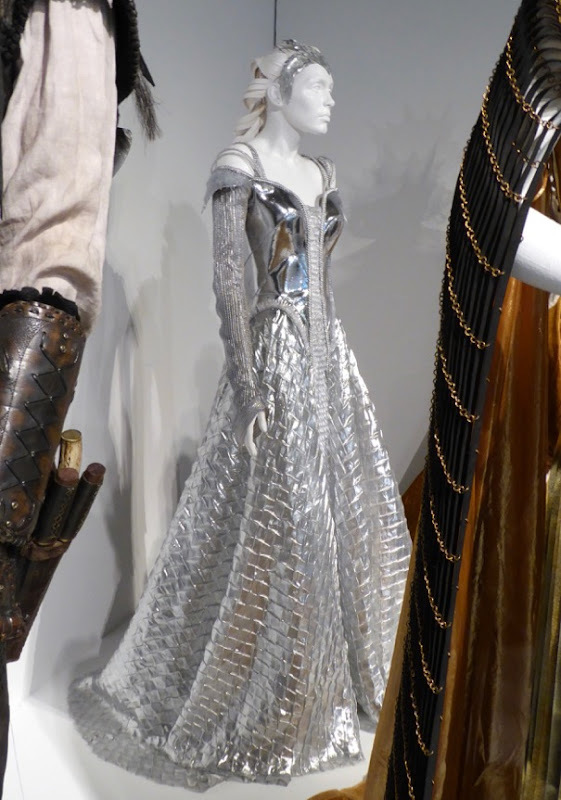 In last year's prequel and sequel to 2012's Snow White and the Huntsman, the fairytales of the Brothers Grimm's Snow White and Hans Christian Andersen's The Snow Queen get mashed up to produce another dark medieval fantasy where Charlize Theron plays the evil sorceress 'Queen Ravenna' and Emily Blunt stars as her younger, ice-powered sister, 'Freya'. 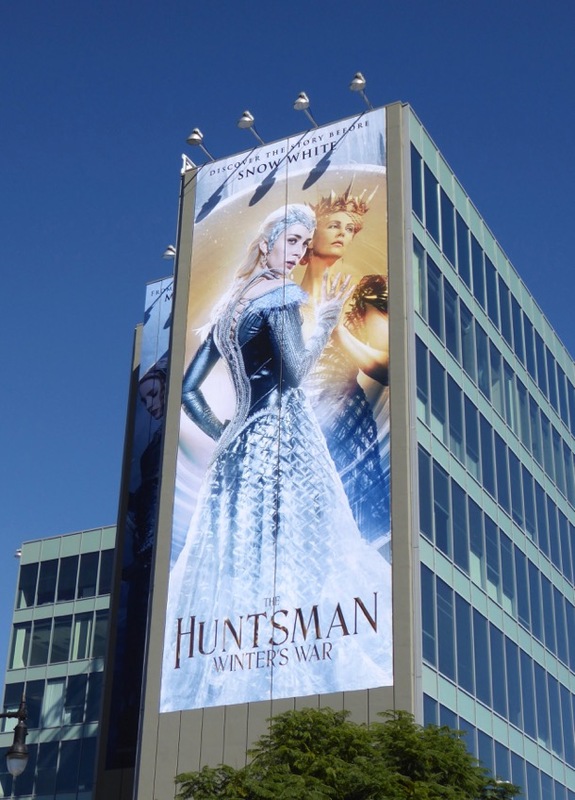 Chris Hemworth and Jessica Chastain play two trained Huntsmen whose love and lives are tested by these wicked siblings. 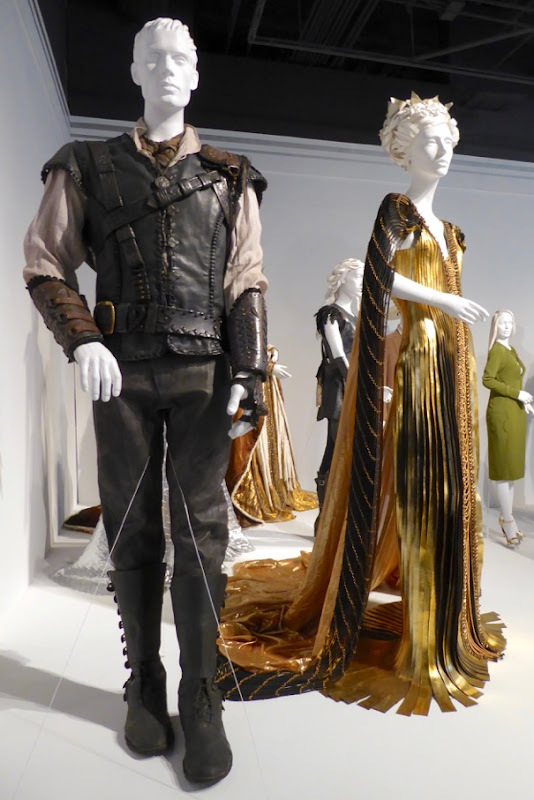 These fabulous costumes from the film were designed by Oscar-winning Costume Designer Colleen Atwood and were photographed on display at Downtown L.A.'s FIDM Museum where they were one of the highlights of the 25th Art of Motion Picture Costume Design exhibition on February 8, 2017. 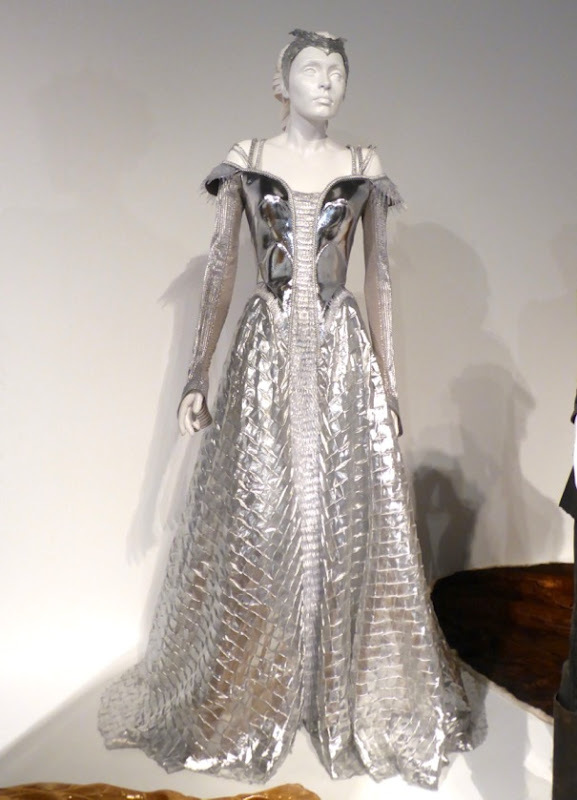 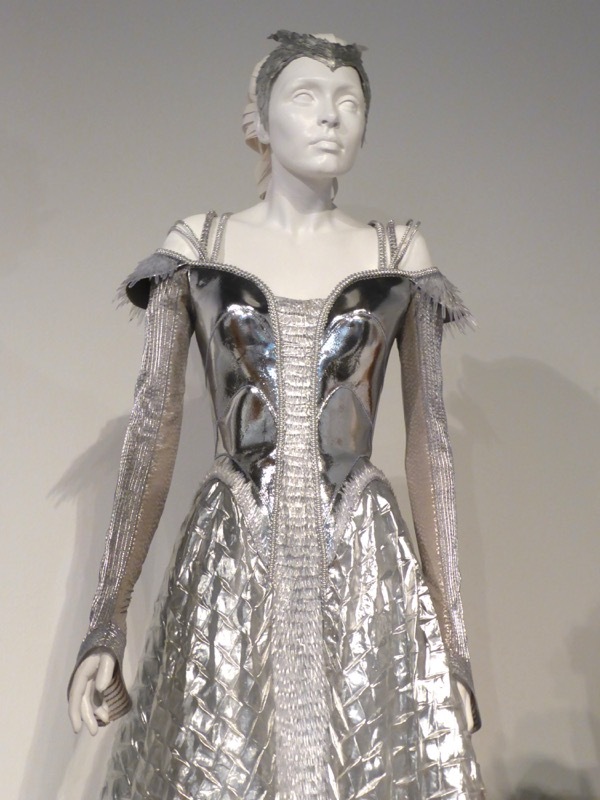 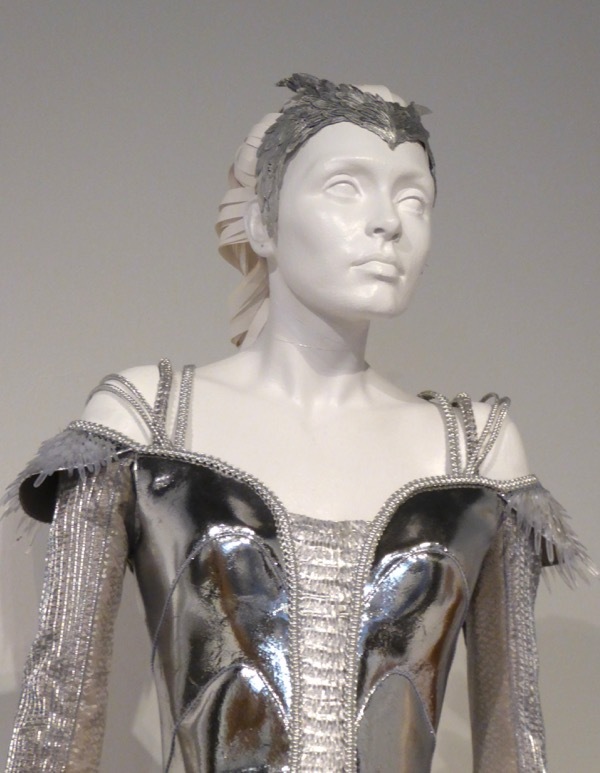 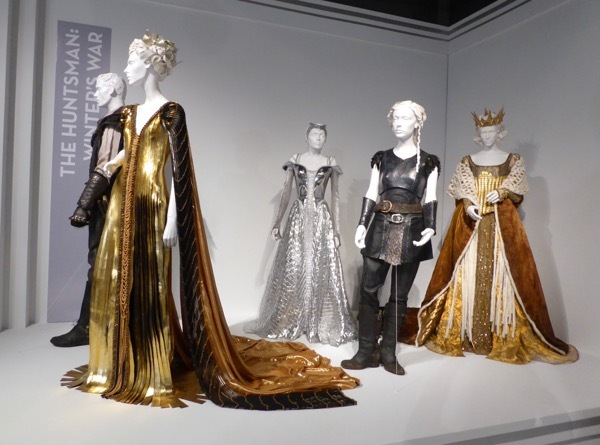 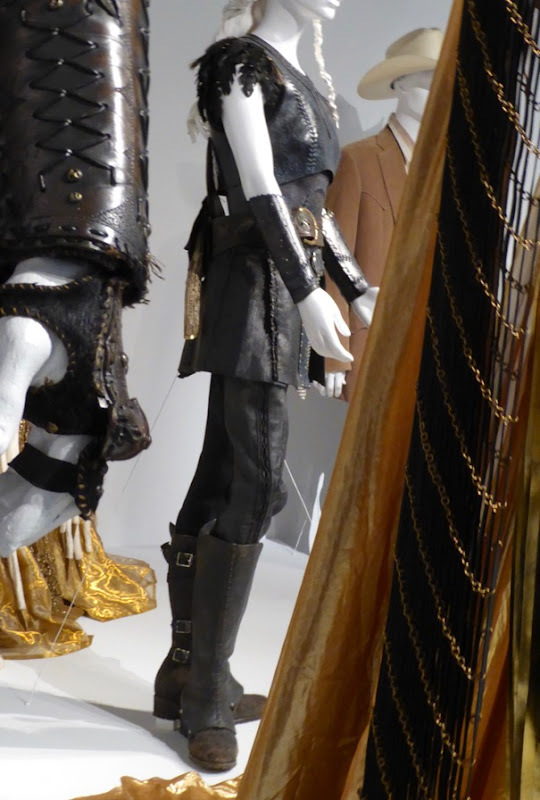 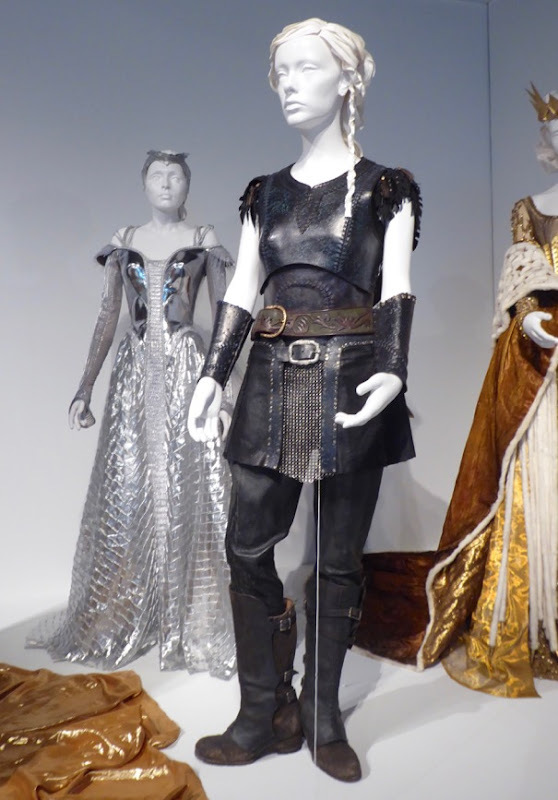 Plus for more of her elaborate costumes designs for which she received one of her twelve Academy Award nominations, make sure you also check out Kristen Stewart's coronation gown from Snow White and The Huntsman from 2012. 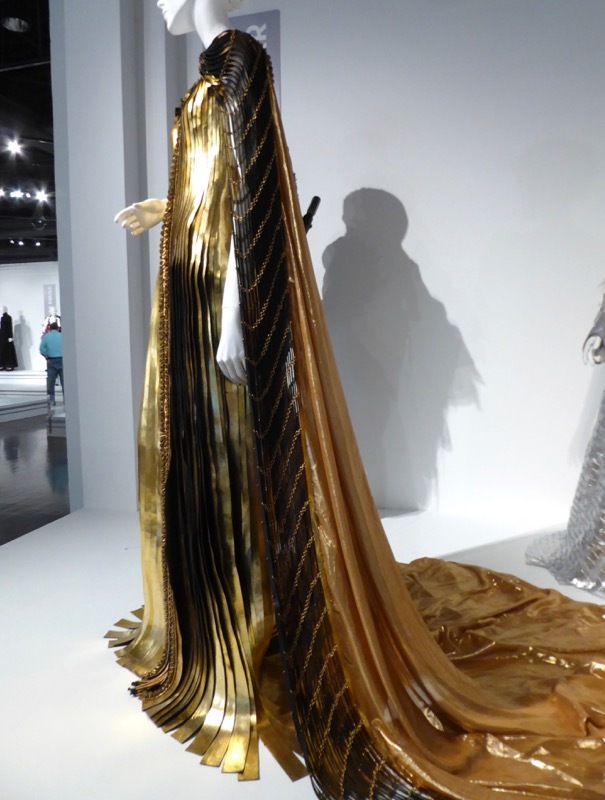 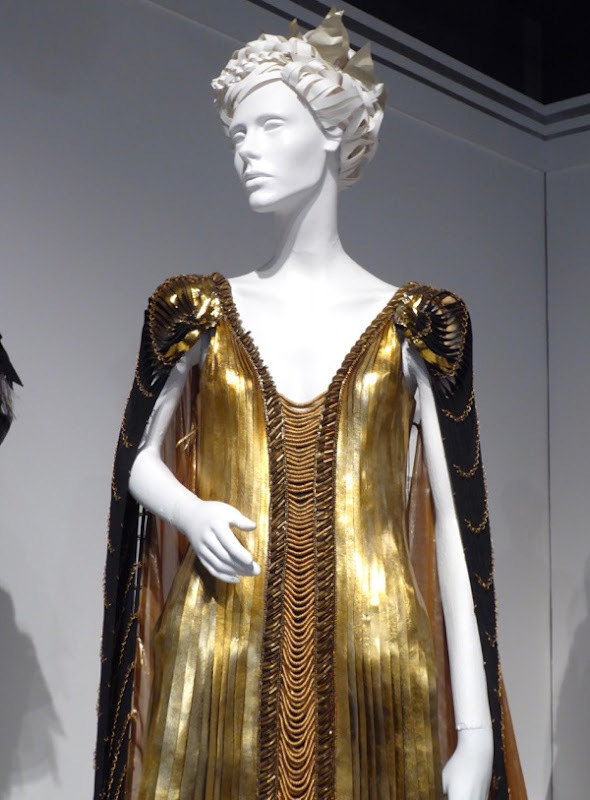 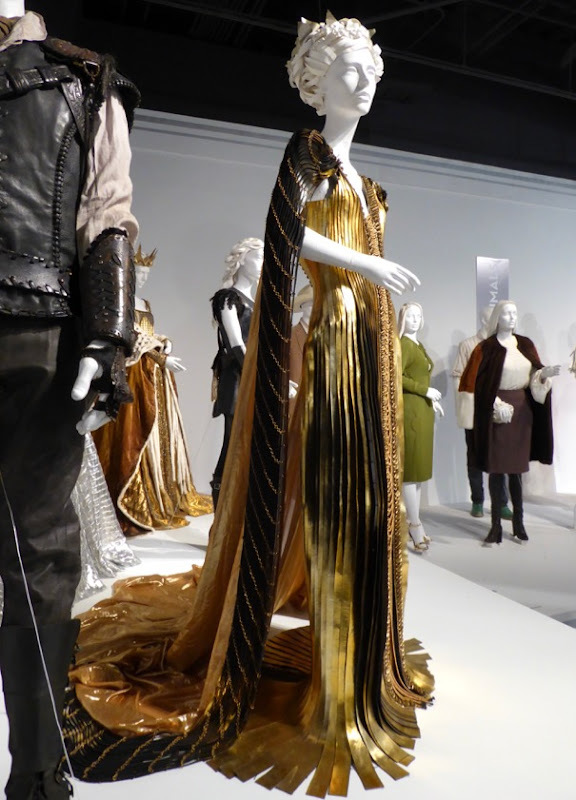 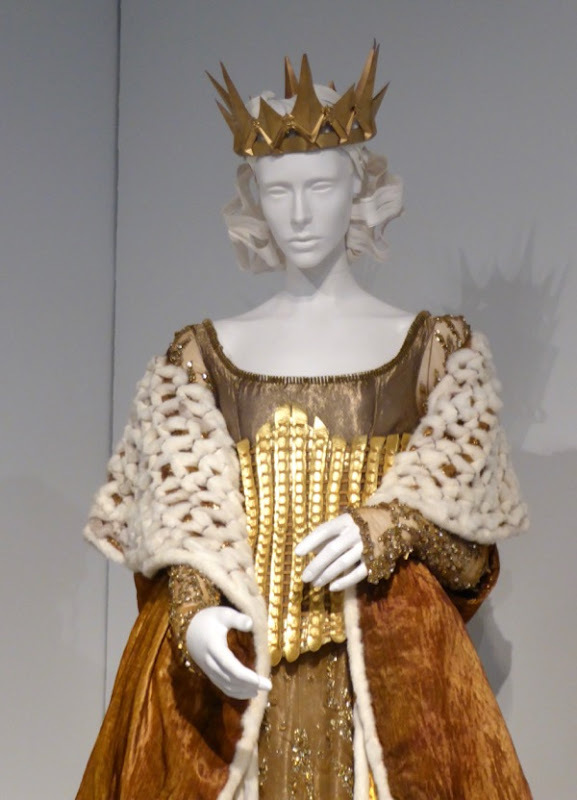 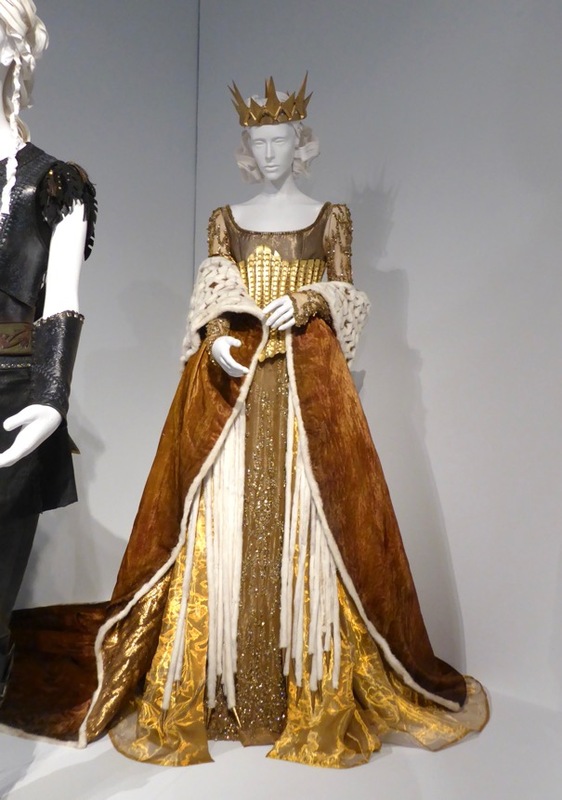 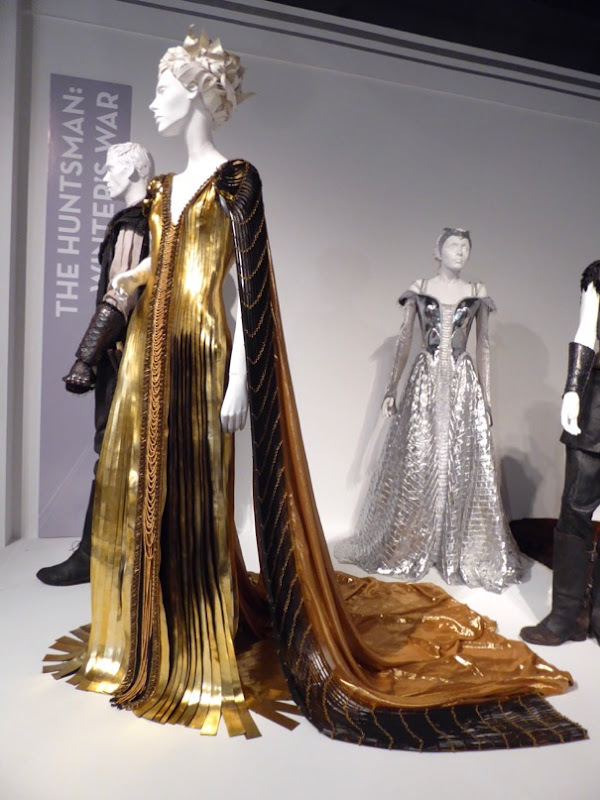 Queen Ravenna's dramatic 'molten dress' is one of the stars of this movie costume exhibition and the golden leather, almost Venetian blind striped gown gives the sorceress the appearance that she's just stepped out of a liquid mirror. 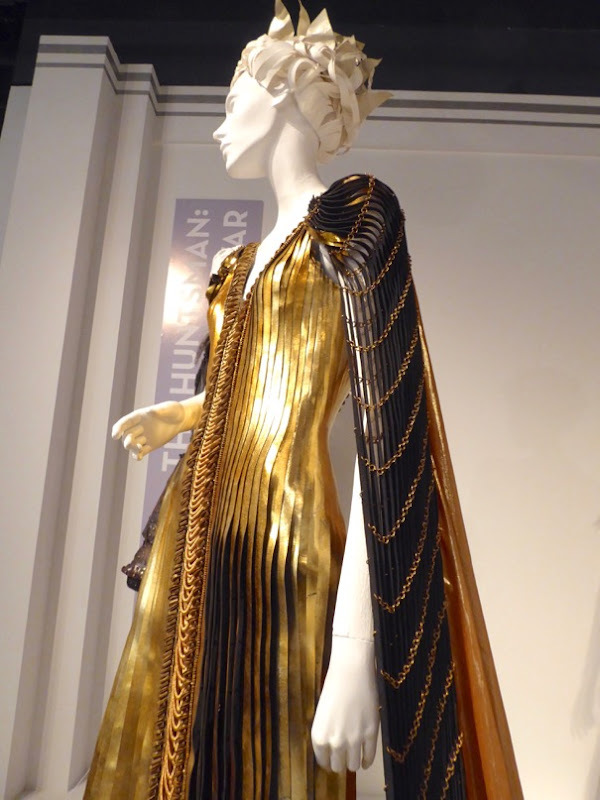 As graceful as it looks, this spectacular costume was apparently very heavy to wear. 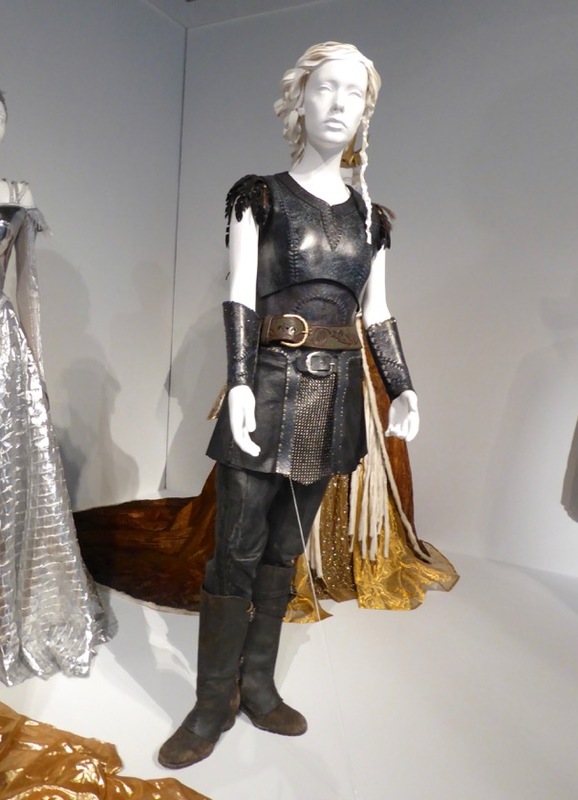 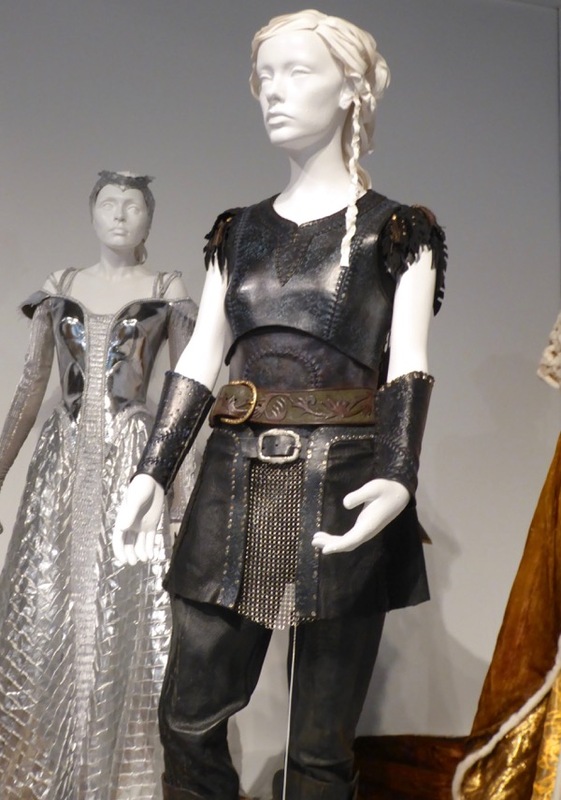 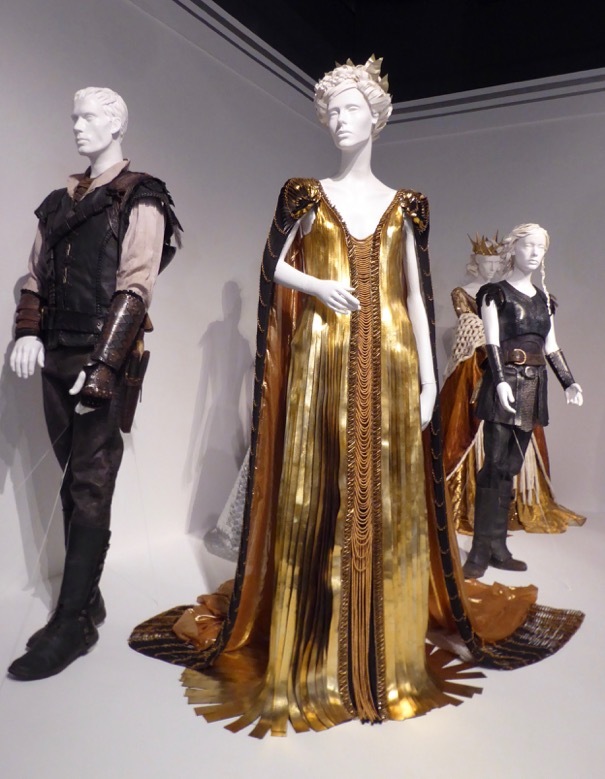 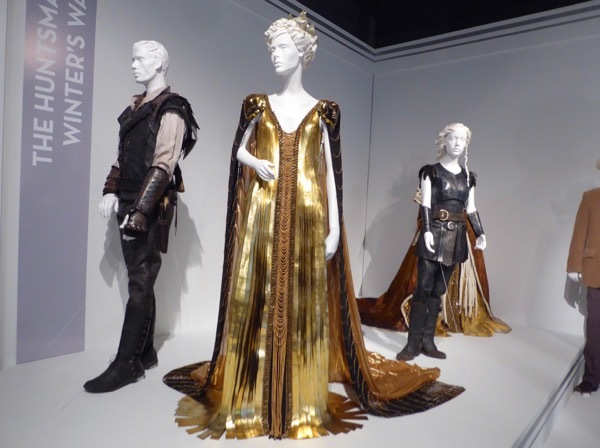 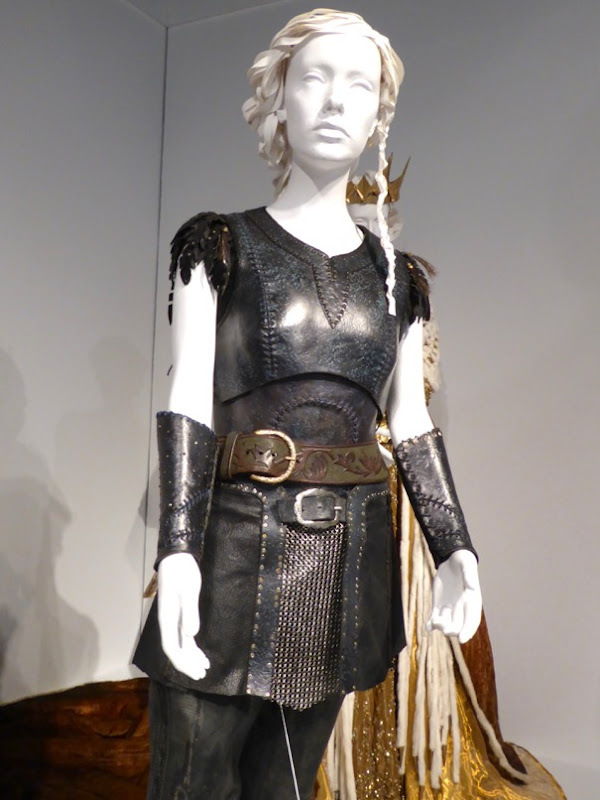 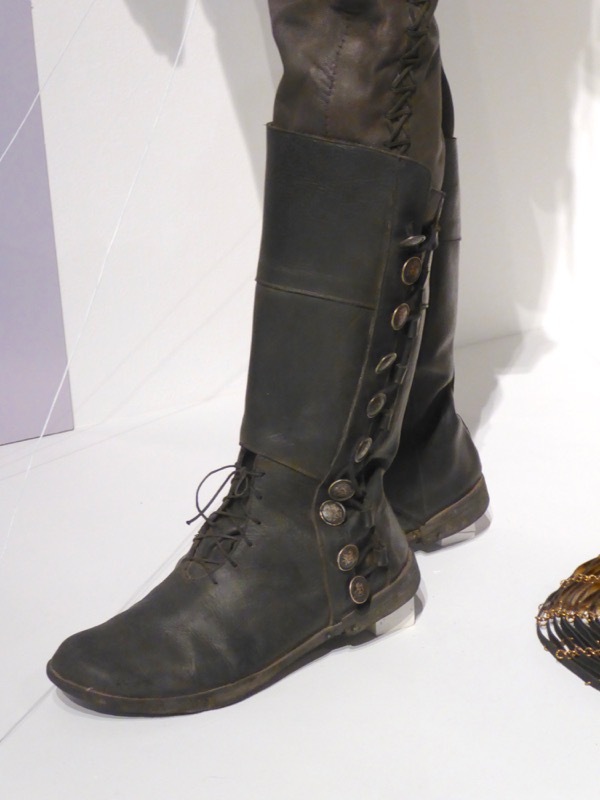 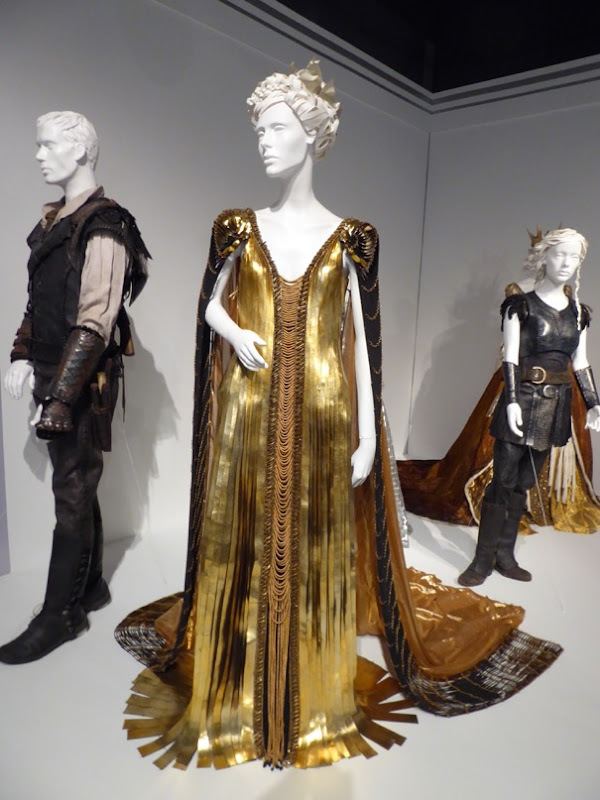 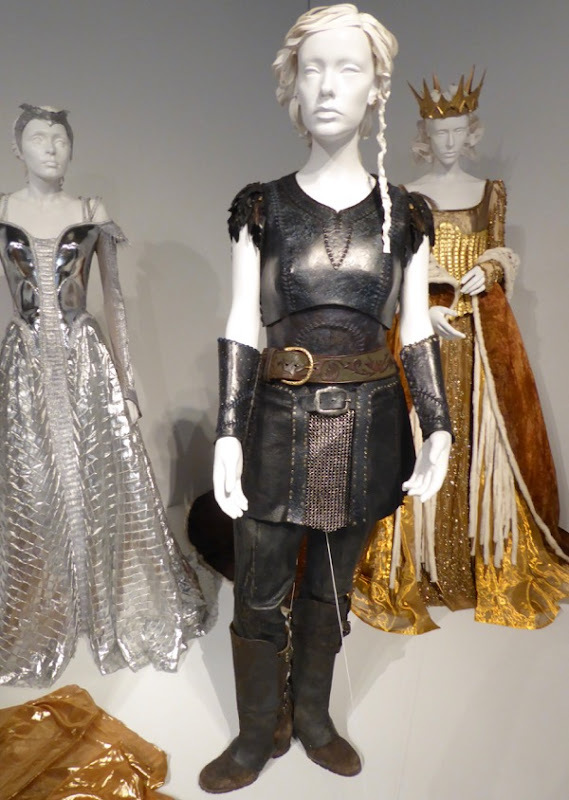 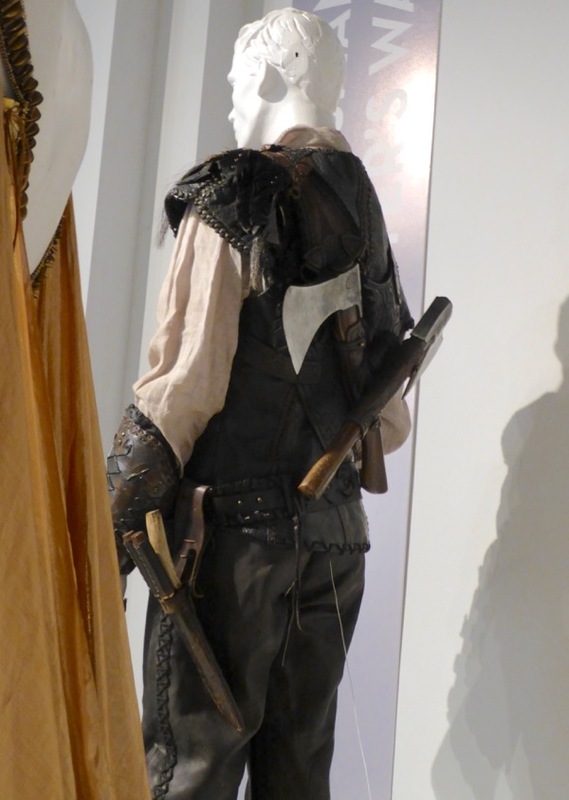 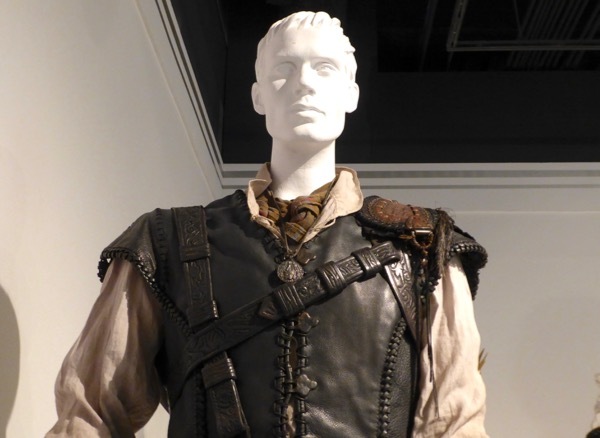 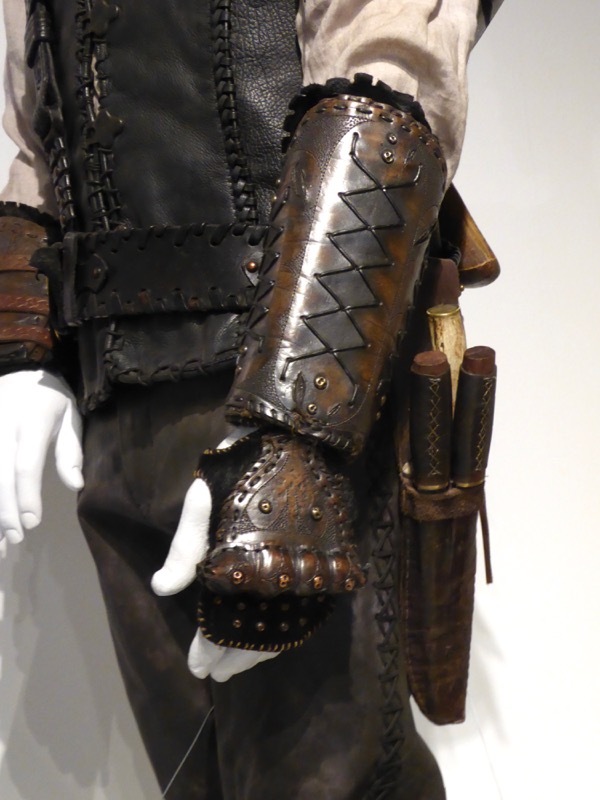 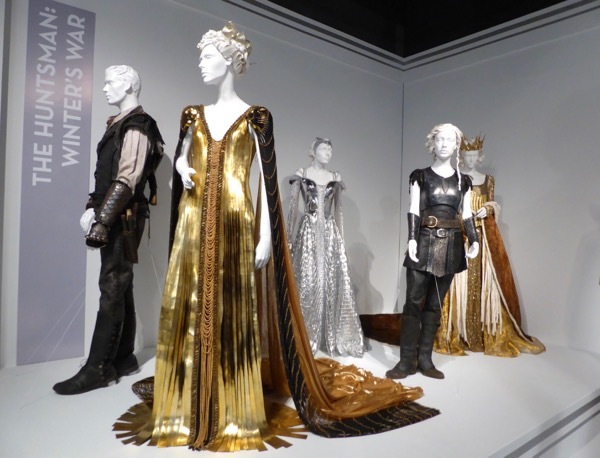 Here's also Ravenna's regal robes, and for another fierce costume worn by South African actress Charlize Theron, you can also enjoy her Oscar-winning Imperator Furiosa costume from Mad Max: Fury Road on display. 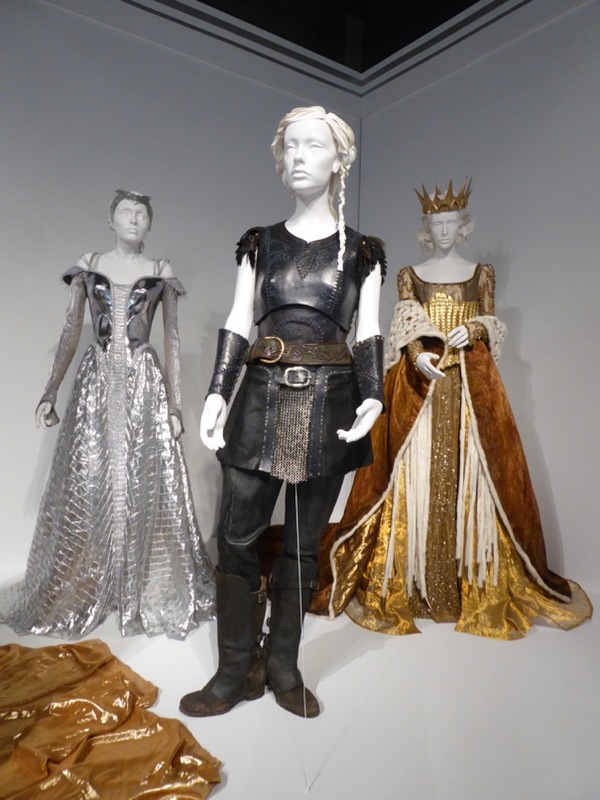 In the film after her baby is murdered in its crib, 'Freya' flees her sister's kingdom and establishes her own as the 'Ice Queen', abducting children and training them to be an army of fearsome Huntsmen warriors to fight for her. Admirers of the British actress can also enjoy her Baker's Wife film costume from Into the Woods and these period gowns from The Wolfman on display. 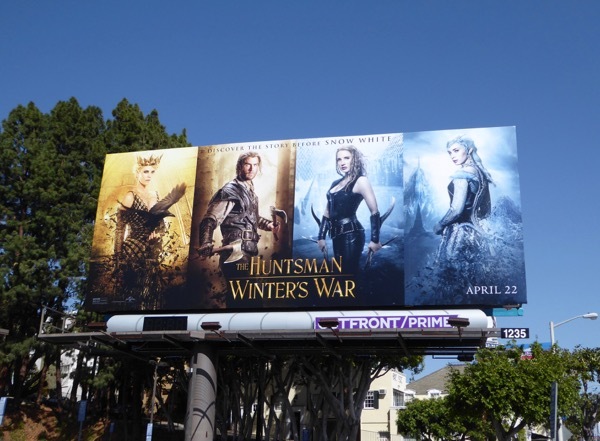 American actress Jessica Chastain plays one of the abducted children raised as part of the Huntsmen who falls for and secretly marries fellow warrior 'Eric'. 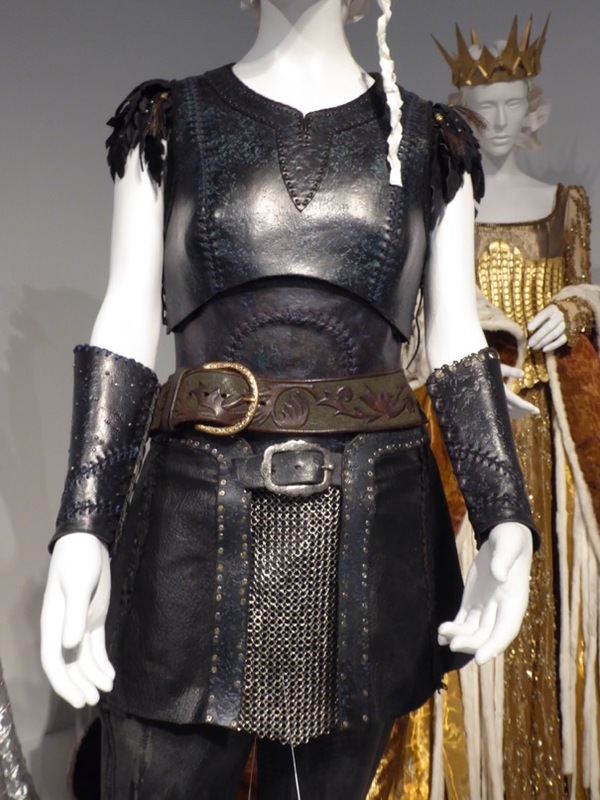 Discovering their love, Freya uses her magic to tear them apart, until they discover the truth and are reunited in the future. 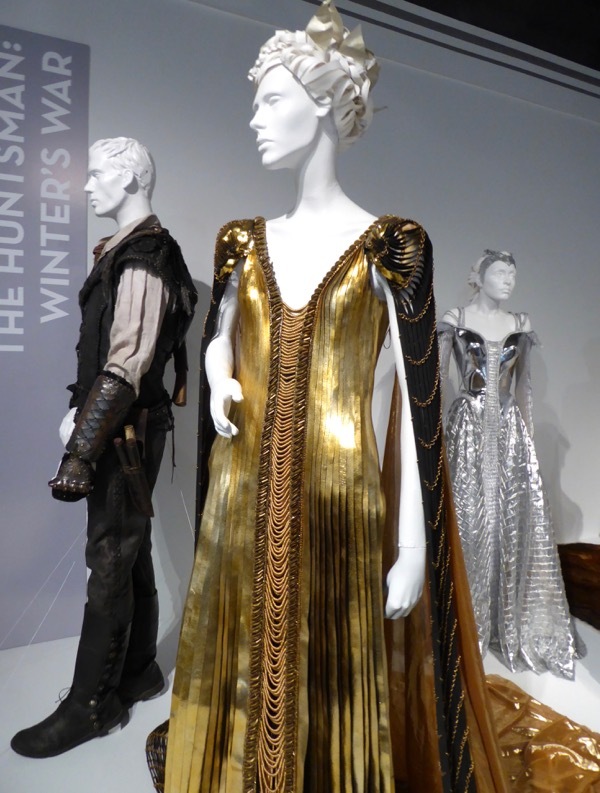 For more of Jessica Chastain's wardrobe from her other movie roles can enjoy these Gothic movie costumes from Crimson Peak and her 1950s-inspired costume from The Tree of Life. 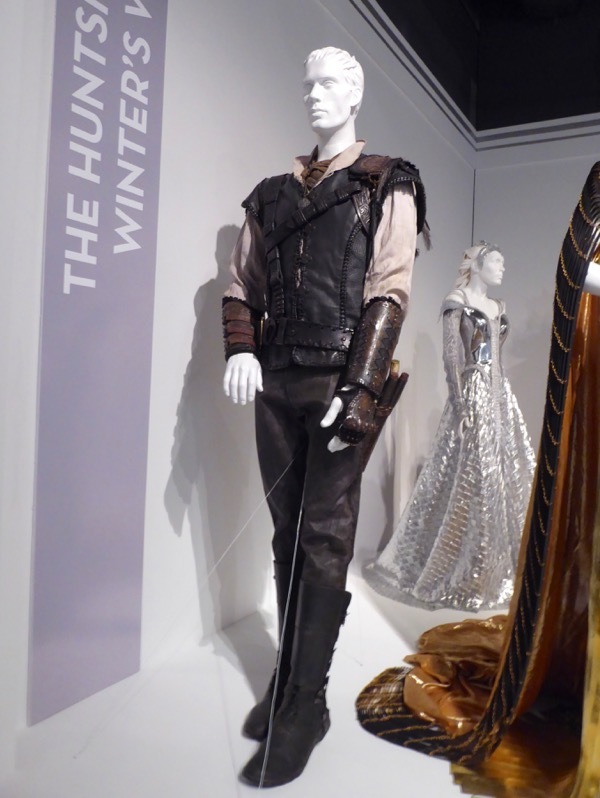 Chris Hemsworth reprises his role as the Huntsman from the 2012 fairytale-inspired movie and we get to see his origin story. 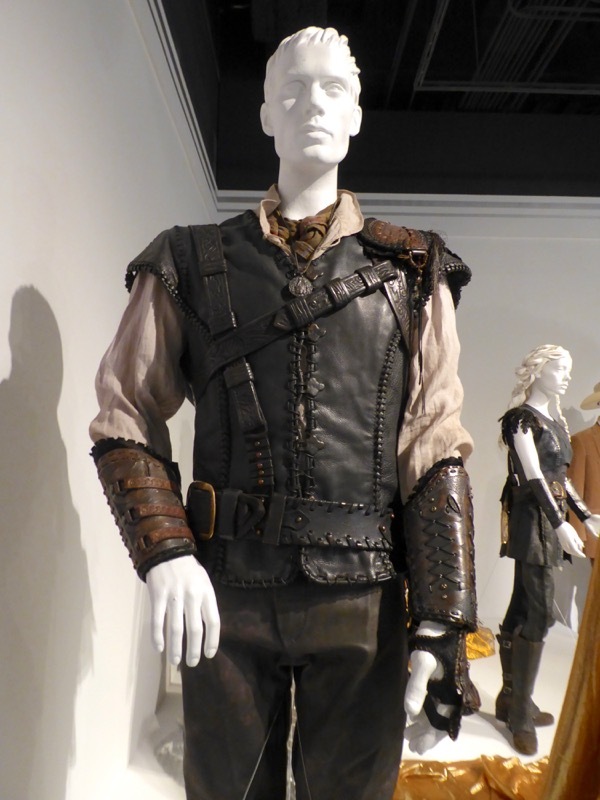 Fans of the hunky Aussie actor can also check out his Thor costume from Avengers: Age of Ultron on display.